The 3rd IRB Barcelona PhD Students’ Retreat aims to bring its PhD student community together to exchange experiences and knowledge. This event will include talks and poster sessions presented by and for students. Furthermore, speakers from outside IRB Barcelona will be invited to give presentations, thus providing participants an insightful view into career options after IRB Barcelona. IRB PhD students: The total amount is 50 euros per student (Including an overnight stay at the Hotel Bernat II): 20 euros are covered by the student and 30 euros by his/her Group Leader (GL). Please note that you will have to pay once we send you an email after the deadline. BIST Students: two members of each BIST member Institute will be selected to attend the retreat. ENABLE Students: 2 member of each ENABLE Institute (RIMLS, CPR and SEMM) will be selected to attend the retreat and awarded a fellowship to cover the registration fees and accomodation. Each IRB Barcelona PhD student (except PhD students from 1st year) is requested to submit a short abstract in English (max. 400 words). Abstracts must be uploaded online before 28 January 2019. Students who are selected to give a talk or to present a poster will receive confirmation before 28 February, 2019. Please note that any communication from you to the 3rd IRB Barcelona PhD Students’ Retreat, including, but not limited to, abstracts, poster or oral presentations will be deemed non-confidential and will be considered public disclosure that might also be included in the conference booklet. To register, please fill out the registration form. The PhD Retreat will last two days, beginning on the morning of Friday 22 March and finishing on the afternoon of Saturday 23 March. All the events will be held at the Hotel Bernat II in Calella de Mar. (1st year PhD Students are welcome to send an abstract although it is not mandatory. 2nd, 3rd and 4th year PhD Students are required to send an abstract). Abstracts from PhD students (except those in their 1st year) may be selected for giving an oral presentation. Oral Presentation: 10-min presentation + 5-min discussion. Poster presentation. Abstracts from PhD students will be selected for poster presentations. Oral presentation: 50-min presentation + 10-min discussion. Prizes will be awarded for: the best talk and best poster presentation. This year, IRB Barcelona offers the possibility to travel to the hotel by bus at no extra cost. If you wish to take advantage of this service, mark the corresponding box in the registration form. 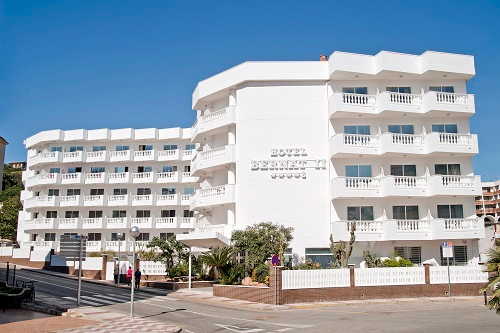 The Hotel Bernat II Calella is situated 60 km from Barcelona. Take the C-31 motorway, direction Girona/Mataró/Badalona Sud, merge onto C-32 and take exit 122 toward Calella/Pineda de Mar/Sta. Susanna. Take Ronda de Dalt/B-20/C-32 direction Besós and then, take exit 122 toward Calella/Pineda de Mar/Sta. Susanna. The journey from Barcelona takes 1h and 10 minutes. Trains run approximately every 30 minutes. You can consult the timetable on the RENFE website. The hotel is 15 minutes walk from Calella station. Rodalies Barcelona – RENFE or Aerobús to Plaça Catalunya; from there take Line R1 Molins de Rei / L’Hospitalet - Mataró / Maçanet – Massanes until Calella Station. James Sharpe was originally captivated by computer programming, and later at Oxford University he saw the mystery of multicellular development as even more amazing: How the circuitry of gene regulation vaguely resembles electronic control circuits, but with a totally distributed control system (every cell containing the same genome, and thus the same circuit). He then trained as an experimental developmental biologist (PhD at NIMR London), moved to Edinburgh (MRC HGU) to start developing computer models of limb development (1997), invented a new 3D optical imaging technique called Optical Projection Tomography, and in 2006 moved to the CRG (Barcelona) to pursue a systems biology approach to organogenesis - integrating experimentation, imaging and computer modeling. He has recently been appointed as Head of EMBL Barcelona. Maria did her PhD at the Instituto de investigaciones Biomédicas "Alberto Sols" (IIB) with Dr. Ignacio Palmero. She, then, started a postdoc in the laboratory of Dr.Manuel Serrano at Centro Nacional de Investigaciones Oncológicas (CNIO) of Madrid. There, she developed the first mouse model of in vivo reprogramming, for which she obtained the "Notable Advance of Year" prize of Nature Medicine. A second Postdocs send her to Texas where she worked with Prof.Enric N.Olson at the UT Southwestern Medical Center. There, she studied the role of Notch pathway in cardiac reprogramming. Since 2016 she leads a group at Vall d'Hebron Institut d'Oncologia (VHIO) in the field of Cellulr plasticity and Cancer. Her research is foscused on studying cellular plasticity and stemness as targets for anticancer therapy. She is also interested in elucidating the impact of tumorogenesis in vivo reprogramming. Estrella began her ‘scientific odyssey’ at the University of Navarra, Spain, where she gained a PhD in Genetic Toxicology. She went for a post-doctoral year to Astra Zeneca in UK. After she joined Almirall as a Clinical Research Scientist, and she has amassed a 26 year career, always in the Clinical Development Arena. Estrella is responsible for clinical trials worldwide, from Phase I to Phase IV.As strategic decision, she does full externalizes all clinical trials, with a strategic focus on keeping only core competencies in house and measuring the delivery of the strategic partner by means if KPIs and quality of the deliverables. In this capacity Estrella has worked with dozens of CROs and service providers, in different therapeutical areas, and now fully focus on Dermatology. Xavier began 32 years ago in the Pharma Industry in a commercial area. After a short period of time moved to an International small pharma company in Barcelona were he had the opportunity to touch many disciplines related to the medical science and business development. That together with his MBA allow him to join Almirall in 1993 in Project Management function. In 1997 after the merger with another very big Spanish pharma company took over the role of head of Regulatory Affairs. That was the first step for making a real multinational company with many medicines commercialized in more than 80 countries worldwide. Matthew earned his PhD in the barren lands of the American Midwest at The Ohio State University in molecular neurobiology: His research investigated molecular mechanisms of gene regulation in neural development and disease.,Matthew is a former European Research Council Marie Curie Sklodowska Individual Fellow. Dr: Murtha began stand up comedy in 2016 and was a finalist in the 2017 Barcelona Comedy Festival. He has performed across the world in cities such as NYC, London, Paris and Barcelona.